We're not all equal, it's simply not true. That isn't science. Biology has at least 50 more interesting years. A clone of Einstein wouldn't be stupid, but he wouldn't necessarily be any genius, either. I think the reason people are dealing with science less well now than 50 years ago is that it has become so complicated. I never dreamed that in my lifetime my own genome would be sequenced. The luckiest thing that ever happened to me was that my father didn't believe in God, and so he had no hang-ups about souls. If you succeed with your first dream, it helps. You know, people trust you, possibly, for the second one. They give you a chance to play out your second one. I am thrilled to see my genome. My heroes were never scientists. They were Graham Greene and Christopher Isherwood, you know, good writers. Some think there is something wrong about enhancing people. You've never heard of an English lover. Only an English patient. Our goal should be to understand our differences. The pace of discovery is going unbelievably fast. I wanted to see if I could write a good book. You can't change the world without offending it. I am putting my genome sequence on line to encourage the development of an era of personalized medicine, in which information contained in our genomes can be used to identify and prevent disease and to create individualized medical therapies. It's necessary to be slightly underemployed if you are to do something significant. At lunch Francis winged into the Eagle to tell everyone within hearing distance that we had found the secret of life. Today, the theory of evolution is an accepted fact for everyone but a fundamentalist minority, whose objections are based not on reasoning but on doctrinaire adherence to religious principles. As an educator, I have always striven to see that the fruits of the American Dream are available to all. I don't think we're for anything, we're just products of evolution. You can say "Gee, your life must be pretty bleak if you don't think there's a purpose," but I'm anticipating a good lunch. I couldn't have got anywhere without Francis....It could have been Crick without Watson, but certainly not Watson without Crick. No one may have the guts to say this, but if we could make better human beings by knowing how to add genes, why shouldn't we? There is only one science, physics: everything else is social work. Never be the brightest person in the room. I just can't sit while people are saying nonsense in a meeting without saying it's nonsense. Be sure you have someone up your sleeve who will save you when you find yourself in deep s-. Father to Son featured in The Chicago Tribune — read the article here. Many of us wonder how our heritage has influenced who we are and what we have become. The renowned scientist and author James D. Watson has more to reflect upon than most. A Radio Quiz Kid at 12 and a University of Chicago student at 15, Watson at 24 had a scientific discovery to his credit—the structure of DNA—that would win a Nobel Prize and forever change our understanding of genes and inheritance. Now, after a lifetime of accomplishment in research, writing, education, and science advocacy, Watson has delved for the first time publicly into his own lineage. 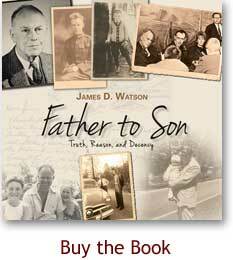 Father To Son was first intended as a small, privately published collection of the writings of his father, James D. Watson, Sr. But when Jim Watson, Jr. began investigating his family history, what emerged was a more complex story—the chronicle of an archetypical American family from before the Civil War to Vietnam. Their history includes settlement in the Midwest, a 20-year association with Abraham Lincoln, a successful search for California gold, and bold but disastrous investments in the stock market. Watson, Sr.'s passion for ornithology led to a short-lived association with Nathan Leopold, who would later be sentenced for murder in the 1924 "trial of the century." His Oberlin friendship with Robert Maynard Hutchins, later President of the University of Chicago, began a family association with the University that continues today. 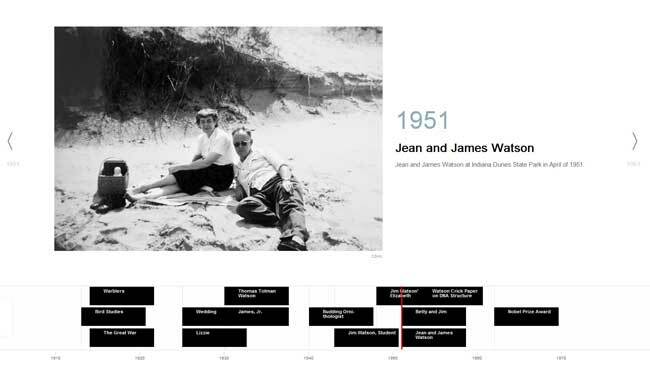 The extended clan also included notable individuals like Watson, Jr.'s great uncle Dudley Crafts Watson—artist and teacher, who, for a time, raised a cousin, Orson Welles, the celebrated actor and director, and an uncle, William Weldon Watson, a physicist and participant in the development of the atomic bomb. In this book, Jim Watson portrays these lives in a fascinating narrative, illustrated with previously unpublished photographs and period documents, that ends with an affectionate tribute to his father, a man of principle, decency, intelligence, and reason, from whom Jim Jr. learned liberal politics and incisive writing. Always iconoclastic, in both science and literature, Watson has written his autobiography in installments, beginning with the now classic The Double Helix, followed by Genes, Girls, and Gamow and Avoid Boring People. Concluding The Double Helix, Watson portrayed himself as "... 25 and too old to be unusual." Yet, in Father To Son, the latest of his unsparing self-examinations, Watson shows us that his heritage was remarkable after all and that "Most certainly I didn't emerge from nowhere!"